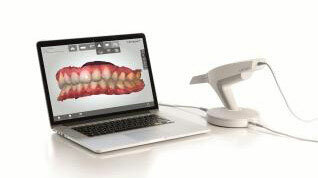 One of the newest (and most exciting) technologies is our optical scanner which captures a precise, 3-D image of the teeth and gums. It almost completely replaces the need for messy conventional impressions. Full-color 3-D images are created using only a small wand that scans your teeth. The digital image can also then be merged with the 3-D CT scan, creating a completely digital representation of both the soft and hard tissues. All proposed teeth and implants can be fitted virtually on a computer screen before any work is commenced on the patient.